Organic and conventional bulk and wholesale Peruvian Quinoa ready for export. Quinoa from Peru is considered the finest quinoa grain. Our quinoa is harvested by hand, by local farmers and farming cooperatives. OrganicCrops does not purchase quinoa from farmers. We sell and export wholesale and bulk quinoa for the farmers as a broker, ensuring that the majority of the sales profit goes directly to the farmers. The farmers benefit from a good living wage thanks to OrganicCrops fair trade practices. Using a fair trade approach we can focus on empowering local farmers to sustain their environment through traditional farming and cultivation techniques. All our quinoa is guaranteed free of pesticides. Types: Raw: Unwashed, unprocessed and unsorted quinoa. Cleaned: Free from impurities, rated and sorted. Processed: Cleaned (scarifying and/or washed) to eliminate almost all presence of saponin (0.06%). Maintaining protein properties. *** Only clean and processed quinoa. Stock quantities subject to change without prior notice. Prices per Kg, in USD. Prices subject to change without prior notice. Quinoa prices vary, depending on type, cultivation type and grade. All sales are subject to the OrganicCrops General Terms and Conditions of Sale and Delivery. Fill out your email address to receive the latest wholesale quinoa prices in your email inbox. Error! It seems something went terribly wrong. Succes! Your email address has been added to the Quinoa Price Alert. To receive a quotation please complete the form below. Someone from our sales team will then be in touch to provide you with a quotation. Please provide as much information about the packaging specifics such as weight, dimensions, material, sealing/closing, film/printing, etc. EXW - Ex Works Lima warehouse FOB - Free on Board, Port of Callao, Peru CFR/CIF - Cost, (Insurance) & Freight Please select preferred INCO terms. For more information visit https://www.incotermsexplained.com. In case of air freight only CFR INCO terms are accepted. Please enter the shipping (sea/air) port. Please advice any additional procurements requirements your business may have. If you have any specific shipping instructions or requirements you may enter them below. The Request for Quotation was send successfully. A copy has been dispatched to your email address. The Request for Quotation was not send. There seems to be something wrong with our website. The web guru has been notified. No. It is sometimes called a pseudo-cereal because of its grain-like appearance and sometimes a pseudo-oilseed because of its high fat content. Generally speaking, quinoa is a seed. For marketing purposes it is often described as a grain. Like most other products the wholesale price of quinoa is based on product demand and product availability (supply). 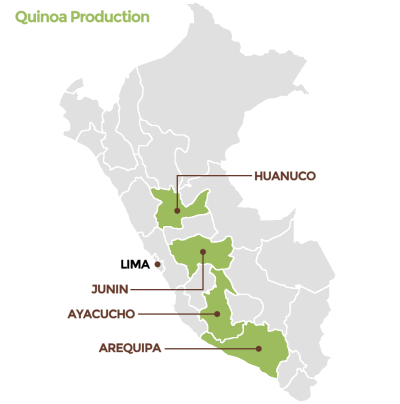 As of 2014, we saw a large influx of quinoa supply from Peru. This increase in supply caused a significant drop in the quinoa wholesale market price. Quinoa grows at an altitude of 3000 – 4000 meters above sea level. In the Andes of Latin America, small farmers grow quinoa on 1-3 hectare plots. Quite often on the hillside. Farming quinoa is hard work. Most farmers do not use modern farming equipment and work the lands the same way their ancient ancestors did hundreds of years ago. First the quinoa is filtered and sorted to get rid of foreign material such as small stones, plant parts, sand, etc. Next step is removing the saponin layer. This is either done dry or wet. When done wet the quinoa needs to dry after processing. Optionally the quinoa is slightly toasted to improve flavor and shelf-life. High-end quinoa is also polished. The polishing process makes the quinoa look ‘whiter’ and gives it a slight shine. After processing the quinoa is packed in PP woven bags and stored in a temperature/humidity-controlled warehouse. Quinoa is usually exported in large quantities (20 – 500 tons). Shipping is done in 20 or 40-foot containers. In Peru companies use Callao as port of departure. The quinoa importer or quinoa distributor needs to transform the bulk product into a consumer product. Quinoa is often sold as a ready-to-cook grain product like rice. But quinoa lends itself for value added consumer products such as Quinoa flakes, Quinoa pop, Quinoa flour, Quinoa pasta and so on. Why is quinoa categorized as a superfood? Complete protein. Quinoa contains all 9 essential amino acids that are required by the body. Quinoa contains lysine. Lysine is essential for body tissue growth and tissue repair. Magnesium. Quinoa is high in magnesium, an incredibly versatile and important nutrient that many doctors, nutritionists, and researchers believe is the single most important nutrient for human health. Quinoa contains Iron which helps keep our red blood cells healthy. There are many benefits of iron, it aids in neurotransmitter synthesis, regulation of body temperature, enzyme activity and energy metabolism. Fiber. Quinoa is high in fiber, much higher than most grains, which helps maintain bowel health, lowers cholesterol levels, helps control blood sugar levels and aids in achieving healthy weight. Antioxidants. Substances that neutralize free radicals and help fight ageing and many diseases. Quinoa has interesting molecules called flavonoids. Two flavonoids, quercetin and kaempferol, are to be found in quinoa in high concentrated amounts. Quinoa is also a good source of manganese and copper that act as antioxidants and help your body to get rid of disease-causing substances. How should I market quinoa? Quinoa became popular in 2008 when Oprah Winfrey included quinoa in her “21 day cleanse diet.” In 2013 the Food and Agriculture Organization (FAO) declared “International Year of Quinoa” and started educating the world about the benefits of quinoa. For many years, quinoa was considered a niche product. Since 2015 quinoa has become a mainstream product and can be found in most supermarkets and eco-shops around the world. Supermarkets in Europe carry more than 20 different quinoa products and new products are added frequently. Wholesale prices of quinoa dropped considerably in 2015. It is expected that the consumer prices will drop during 2016/7 when the ‘old-price’ stocks have diminished. This creates new opportunities for value added products made from/with quinoa flour, quinoa flakes and quinoa seeds. Healthy baked products, breakfast drinks and quinoa enriched soups seem to be products in high demand in 2016. Quinoa is an ideal product for healthy ready-made meals. One can add it to salads, dumplings, puree’s / mashes, meat coating, sauces, etc. All healthy tasty alternatives for regular starch products. Please do not hesitate to contact OrganicCrops if you company requires any assistance in marketing quinoa and quinoa products. How does quinoa compare to other nutrient rich foods? Quinoa is a good source of dietary fiber, has significant amounts of minerals such as iron and zinc and has a high protein content. Compared to other plant foods, quinoa is generally higher in protein than most grains as shown in below table, while lower in protein than most legumes. Quinoa has a good balance between its essential amino acid content compared to other plant foods. Can Quinoa be eaten uncooked? Yes. There are certainly health benefits from consuming uncooked quinoa seeds. Consuming cracked or grounded quinoa seeds contain all of the nutrients. The soft shell that protects the quinoa seeds breaks open during cooking. Your body simply passes the quinoa seed utilizing its full nutritional potential. Quinoa can be used as part of a raw-food diet. Which types of quinoa products are on offer? Quinoa flakes: A quinoa flakes is pressed quinoa. Quinoa flakes contain the same nutrients as quinoa seeds. Quinoa flour: Quinoa flour is made from either milled or un-milled seeds. It has a creamy yellow to ivory color and adds a distinct flavor to baked products. Un-milled seeds produce a coarser, nutritious flour, while milled ones are used to make a much smoother flour. Quinoa Pop/Crip: Quinoa pop is made from washed white quinoa. The white saponin free quinoa is toasted till the seeds pop which gives the seeds a crunchy finishing. Does quinoa need to be washed/rinsed? Raw product – The quinoa is basically straight from the field. It is sifted to remove foreign material. Raw products are unprocessed and are therefore not washed and not sorted. Clean product – Clean quinoa is half-processed. Using a dry-method, the saponin shell is removed. Most of the saponin is removed this way. The quinoa is then sorted on size and color. Pearled product – Pearled quinoa is first cleaned than washed and then sorted. Pearled quinoa is free of saponin. How many varieties of quinoa are there? Quinoa from valleys: Two sub types exist: from dry valleys (like Junín, Peru) and from humid valleys growing between 2,300 and 3,500 meters above sea level, with annual rainfall of 700 to 1,500 mm and a minimum average temperature of 3ºC. Quinoa from highlands: Grows above 3,000 meters with rainfall between 400-800 mm/year and a minimum average temperature of 0°C. Quinoa from salt flats: Grows at an altitude of nearly 3,000 meters, with rainfall between 250-400 mm/year and an average temperature of -1ºC. Quinoa from sea level: Grows from sea level to 500 meters with rainfall of 800-1500 mm/year and a minimum average temperature of 5ºC. Quinoa from subtropical zones: Grows at an altitude of 2300-1500 meters, with rainfall from 1,000 to 2,000 mm/year and a minimum temperature average of 7º C.
Improved or commercial quinoa: Those that have been selected or subject to genetic improvement processes in experimental stations. Do quinoa flakes have the same nutritional values as quinoa seeds? Yes, quinoa flakes have the same nutritional breakdown as regular quinoa seeds. What else is quinoa used for, apart from eating? The whole plant is used as green forage. Harvest residue is also used to feed cattle, sheep, pigs, horses and poultry. Quinoa leaves, stems and grains have been used traditionally by the indigenous peoples of the Andes for medicinal purposes: healing wounds, reducing swelling, soothing pain (toothache) and disinfecting the urinary tract. They are also used in bone setting, internal bleeding, and as insect repellents. A quinoa protein concentrate which is food- or pharmaceutical-grade has the potential use as an ingredient in human or animal nutrition supplements. Saponins extracted from the bitter quinoa variety have properties that can induce changes in intestinal permeability and assist in the absorption of particular medications. Saponin is used in a variety of products such as beer, shampoo, detergents, toothpaste, pesticides and antibiotics. Quinoa flour is used for bread, biscuits, dumplings, sauces, noodles, desserts and sweets. Quinoa flakes are used in drinks, soups, yoghurt breakfast drinks and granola bars. Yes. Quinoa does not contain gluten and can safely be consumed by those with a gluten-intolerance. Can quinoa be consumed by diabetics? Yes. As a complex carbohydrate, Quinoa has a low glycemic index. The body will digest the sugars slowly, maintaining proper insulin levels. Consult with a physician about maintaining blood sugar levels.